I have only recently started reading Val McDermid’s books and after reading one of her stand-alone books, A Place of Execution, I decided to move on to her Karen Pirie books. The first one is The Distant Echo (first published in 2003) in which Karen doesn’t play a major role – only appearing in Part Two as a Detective Constable. Twenty five years later, the Cold Case file on Rosie Duff has been reopened. For Alex and his friends, the investigation has also opened old wounds, haunting memories-and new fears. For a stranger has emerged from the shadows with his own ideas about justice. And revenge. The nightmare began when student, Alex Gilbey found Rosie Duff dying in the snow in the Pictish cemetery in St Andrews. He ran to the nearby housing estate to get help and finding a policeman in his patrol car told him what he had found. By the time they got back to the body, Rosie was dead, despite the efforts of Alex’s friends to keep her alive. He and his three friends were the prime suspects, both the police and Rosie’s thuggish brothers were convinced they were guilty. But DI Barney Maclennan and his team, including DC Burnside, WPC Janice Hogg and PC Jimmy Lawson (the policeman Alex asked for help) were unable to find enough evidence to charge them with the murder. Nearly half the book concentrates on the crime and the initial investigation, going into detail about each character and the circumstances of the murder, ending dramatically with another death. I felt I knew all the characters but had little idea who had killed Rosie or why. The case lay dormant for 25 years. In 2003 Jimmy Lawson, now an ACC, is in overall control of the cold cases squad and is keen to enhance his reputation by getting at least one result. He assigns DC Karen Pirie to the Rosemary Duff case and asks her to find the physical evidence, which is missing from the box it’s supposed to be in, before interviewing the original witnesses. A new character comes onto the scene – Graham MacFadyen – with additional evidence that the police were not aware of at the time. The second investigation begins, equally as in depth as the first. The four students, all now with settled careers, are questioned again. I just couldn’t work out which one of them, if any, was guilty. I couldn’t believe any of them would have murdered Rosie. And then a vague suspicion grew in my mind and I revisited the events immediately after the body was discovered, only to dismiss my idea as fanciful. Val McDermid is so skillful in giving you the clues and then leaving you in suspense (or at least that was my experience). There is a major twist that completely threw me before the dramatic ending when I realised that my initial suspicion was correct after all. I have book 3 of this series, The Skeleton Road, on my tbr pile. Picked up, free, a few weeks back. Not sure if I ought to start with this first book that you’ve just read before I read that. It sounds very good so would not be a hardship. I’m really glad you enjoyed this as much as you did, Margaret. McDermid certainly is skilled, isn’t she, at developing characters and getting the reader drawn into the story. I’ve still not read this one! But it sounds great! 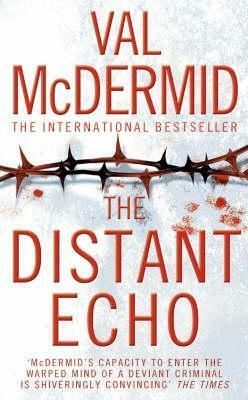 I’ve been swithering for ages about maybe reading some Val McDermid books, especially as she’s a local author. I’ll definitely give her a go now. I hope you do, Katrina. I wish I’d read her books years ago! Now I am really excited to get started on this book. I’m glad you featured McDermid’s books.